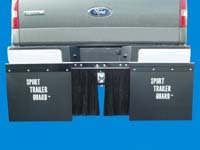 Sport Trailer Guards, Mud Flap Assembly. "Click on Details" under product picture to go to more detailed product information, product accessories and more photos. OPTIONAL: SG-230; "Center Skirt" for the SG-224 "Sport Trailer Guard"
FREE SHIPPING!!! When ordered with SG-224. SG-224-5; "Replacement Mud Flap" is 1/4" Thick x 24" High x 24" Wide with a ribbed back. The flap does have the "Sport Trailer Guard" wording on it.